Warning: clear and present danger of holiday fun! With the clear and present danger of the holiday season—cut throat shoppers, deadlines, monsters—one can never be too prepared. 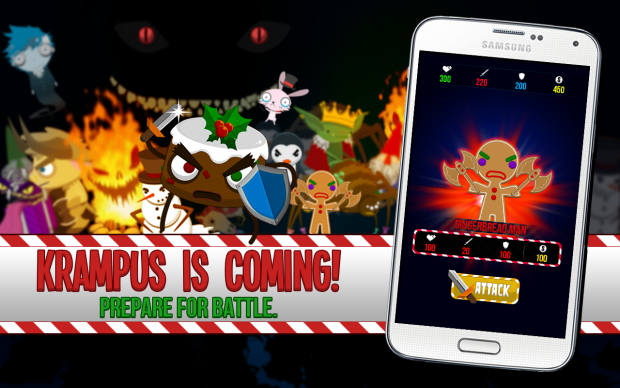 Stock up on swords, boomerangs, and weaponized yo-yos this holiday season as you wage battle against the dangers presented to you in gift form: killer spiders, xmas gingerbread men, gnomes, goblin kings, combative fruit cakes, and of course the fearsome Krampus. Strategize as you fight your way to victory on the score boards. Collect weapon stats or sell them for precious gold, being sure you’re always strong enough to defeat an endless stream of enemies. Screenshots of the new holiday themed game, Felipe Femur: Present Danger!